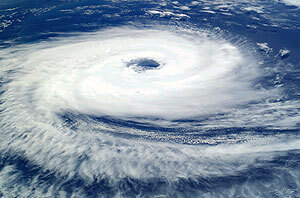 Despite grim predictions in light of the 2005 season, the 2006 [Atlantic] hurricane season in the US came to an end without a single one making landfall in the USA. The providential ‘culprit’ this time was an early El Niño,1,2 a warm Pacific current that sometimes starts along the north-western coast of South America on Christmas Day (El Niño means The Infant [baby Jesus] in Spanish) significantly changing the weather patterns in the eastern Pacific. This changes the intensity of the easterly trade winds in the Atlantic, which in turn influences the paths hurricanes follow. In years with El Niño, the easterly trade winds in the Atlantic are stronger and they will tend to push hurricanes further east, thus diminishing the probability of landfalls. The triggering of El Niño is still not well understood but seems to be linked to deep ocean water circulation in the Pacific Ocean, which is part of a global circulation system known as the thermohaline circulation system (THC). In years without El Niño, the westerly trade winds in the tropical Pacific push warm water westward, so that the ocean around Indonesia is about 0.5 meters higher than near the coast of Ecuador!2 Cold, nutrient-rich deep waters upwell off South America, massively increasing the bio-productivity of these waters. This cold water also limits the amount of rain in the Americas whilst the warmer water in the western Pacific causes rains and generally wet weather in south-eastern Asia and north-eastern Australia. During El Niño years the situation is reversed; rains and floods affect the Americas whilst drought afflicts the western side of the Pacific (the 1982–83 drought in Australia was due to this). many sceptics are not deniers of global warming, only doubters of the significance of the role humans play in it. The THC is far from being well understood and because of this, reliable long-term forecasts are still not within reach. It is however fairly well documented that this circulation system (which moves about 20 times more water than all the rivers on Earth) is the true engine that drives climate on Earth and is controlled by salinity (the amount of salts dissolved in the ocean waters). Events like the Lake Agassiz flood in North America at the beginning of the Holocene have significantly influenced it and triggered dramatic cooling during the episode known as the Younger Dryas. Another similar episode has been recently recognized as having as its source the catastrophic draining of a huge freshwater lake underneath the ice sheet in Antarctica.3 If significant amounts of fresh water are suddenly dumped into the THC, the system will be disrupted and intense climate cooling will ensue. Another such event could occur if Lake Vostok (larger than Lake Ontario) situated 3,600 m below the surface of the ice, would be suddenly drained into the ocean. Such an event is possible in the case of global warming but its occurrence would immediately trigger an opposite trend: a dramatic global cooling. This reveals one very interesting aspect of God’s creation: its ability to maintain homeostasis (constant climate conditions in this case) by way of dynamic mechanisms similar to feedback loops. In light of all these, one cannot but wonder how some scientists can be so sure in their dark predictions of global climate change in the near-future? Their apocalyptic predictions uttered as certitudes have even led some politicians to adopt positions that undermine the basic principles of democracy. Thus the UK foreign secretary Margaret Beckett has recently compared climate-change sceptics with terrorists. One wonders what has been left of free speech? After all, many sceptics are not deniers of global warming, only doubters of the significance of the role humans play in it. It is fairly well documented that many natural causes are fuelling global warming. Christians have repeatedly been accused of dismissing global warming because they believe that God, being Creator and Master of the Universe, will take care of His creation and somehow limit the effects of global warming. Well, as we have just seen, God indeed has provided mechanisms in His creation that do control global climate. But this doesn’t mean Christians should not be concerned by the short-term effects of global warming. God has commanded us to subdue nature, but that doesn’t mean He has given us a carte blanche to destroy or disfigure the beautiful world He has given us! We are to be good and loving stewards. And that also means we need to learn more about His creation so that we would gain a better understanding of its complexity, and acknowledge with thankfulness that it does reflect God’s majesty. Lewis, A.R., Marchant, D.R., Kowalewski, D.E., The age and origin of the Labyrith, western Dry Valleys, Antarctica: evidence for extensive middle Miocene subglacial floods and freshwater discharge to the Southern Ocean, Geology 34(7):513–516, 2006. Return to text. Charlson, J.R., Lovelock, J.E., Meinart, O.A., Warren, S.G. Oceanic phytoplankton, atmospheric sulphur, cloud albedo and climate, Nature 326:655–661, 1987. Return to text.